Wow. If the Debka report is correct, and I have found it very dependable in the past, things are getting mighty interesting. 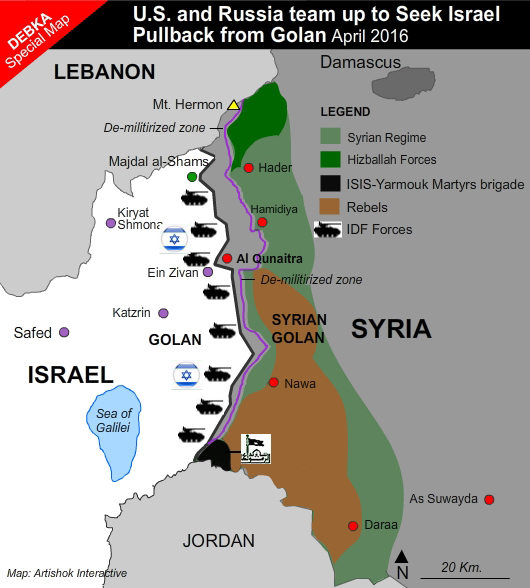 If Israel were to lose the Golan Heights, their ability to protect themselves would decrease dramatically. Mr. Netanyahu knows how important the Golan is to Israel’s survival. Mr. Putin comes from a country where chess is very important. He is a master tactician. Just last week he “tested” the United States by allowing Russian jets to “buzz” a U.S. destroyer. I think that Mr. Putin thinks that Mr. Obama is a cupcake. Would Mr. Putin allow U.S. jets to “buzz” a major military ship, threatening the entire crew, and do nothing? I think not. As a substitute teacher, I am tested on a daily basis. Having “car duty” after school today, my job was to watch students as they waited to be picked up by their parents. The students are to sit and wait. A few of them weren’t sitting. I asked them twice nicely to sit down like everyone else. A few listened, a few didn’t. I warned, “If you don’t sit down, you will have to go over and stand by the lady (principal) holding the megaphone.” One girl didn’t sit down. I waited for about two minutes and then told her she was going to have to go and stand by the principal. What kind of message would I have sent if I had let her “get by” with not listening to a teacher, which is quite disrespectful particularly because of the way I asked? She would lose a bit of respect for me. This is important as, the next time I ask her to do something, she might listen. When it comes to strategy, Putin is a knight while Obama is a pawn. Because Netanyahu has helped keep his tiny little country alive this long, his leadership skills surpass Putin’s. Mr. Netanyahu has something on his side that Mr. Putin doesn’t. It is a covenant that God gave to Abraham, Isaac, and Jacob. It is an everlasting covenant. Israel will not be destroyed no matter how many enemies attack them. Because I believe in the Bible, I believe in the everlasting covenant regarding the land of Israel. Many Bible scholars think that Russia is mentioned in the Bible. If you want to know more about this, leave a comment and I will explain. I am not absolutely certain that Russia is mentioned in the Bible but I think it is a good possibility. I know for certain that Israel will be a major focus, as it already is, in the last days. Many Bible prophecies predict this. Again, if you are interested in these prophecies, please leave a comment. This story interests me because it appears that Israel is alone in its battle to survive, something many Christian students of prophecy believe will happen near the end of days as we know them. This entry was posted on Tuesday, April 19th, 2016 at 8:09 PM and is filed under Commentary, Israel, News. You can follow any responses to this entry through the RSS 2.0 feed. You can leave a response, or trackback from your own site.